Kerry from Laguna Beach CA contacted me about creating a similar coop tour in her town so I provided some information to her on our processes of registration, website, marketing, logos, etc.. So Here is some information about her Coop Tour! Hope it inspire you to do one too! Can you guess which of the Transition Laguna Beach community bike riders above is Rem Khalil (with daughter Zia Khalil Bell) promoting Tour de Coop?! 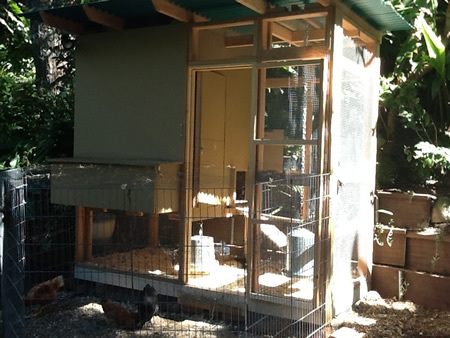 Welcome to the 1st Annual Laguna Beach Tour de Coop on Sunday, Nov. 3, 9 a.m. to 1 p.m., a self-guided bike tour of backyard chicken coops arranged by SEEDS in Laguna Beach. 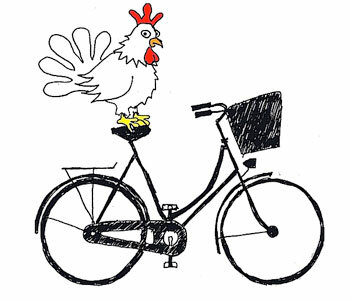 Chicken lovers and the coop curious will bike coop-to-coop to learn all about keeping backyard chickens and their care during this community bike ride. The ride will be approximately 20 miles, round-trip from the Willowbrook Campus, with some steep climbs. All ages are welcome to participate in this free event. Check is from 9 to 11 a.m. at Anneliese Schools’ Willowbrook Campus at 20062 Laguna Canyon Road in Laguna Beach. Coop information, bike maps, guest speaker, water and light refreshments will be available. 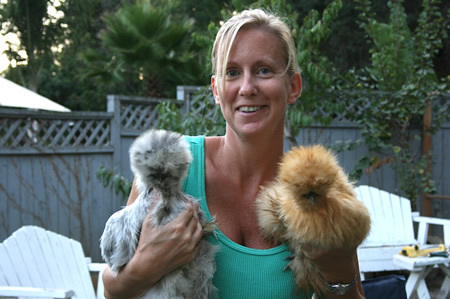 From 9:30 to 10 a.m. enjoy the Coop Scoop Lecture presented by Helia Buyck, the chicken caretaker at Anneliese Schools’ Willowbrook Campus. She will talk about the various breeds at the school and how she cares for them. Late check-in is from 10:30 to 11:30 at 487 Shadow Lane. Receive route map and addresses there too. Visit the coops at your leisure and in any order, they close at 1 p.m. Water, helmets, and sunscreen recommended. Biking is encouraged, but you can drive your car instead. Parking will be limited, and please be courteous to coopsters’ neighbors when parking. Laguna Cyclery (240 Thalia Street) is offering half-off for tune-ups on bikes before the tour. 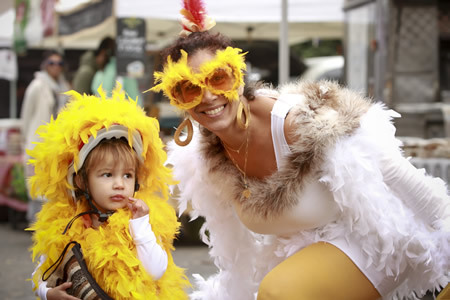 Reem and daughter Zia strutting their stuff at last weekend’s Farmers Market. There’s something about collecting eggs from a chicken coop that tugs at our subconscious, a human desire for home, warmth and safety. If you can find an egg in the straw, you can count yourself lucky. Not many people still hold fond memories of collecting fresh, warm eggs in the early morning on the family farm. I’m lucky enough to remember filtered sunlight coming through the slats of the hen house on my grandma’s farm in South Dakota as we went on our treasure hunt from roost to roost. I’d collect eggs with delighted wiggles, she with her deferred smile, and, of course, experienced instruction. Our precious collectibles were always gathered in her ever-present apron. Ah, that was a good summer. And I never wanted to leave. Leave we do, but the memory lives on. To celebrate that feeling of a fine-feathered home, organizers of Laguna Beach’s first Tour de Coop are asking residents and enthusiasts of the homegrown food movement to hop on a bike this Sunday, Nov. 3, and tour 12 chicken coops from the canyon’s acres to hillside urban farms. That’s not a bunch of horse feathers either. Yes, Laguna Beach is going country. The free bike tour, sponsored by SEEDS Arts and Education, starts at 9 a.m. at Anneliese Schools’ Willowbrook campus, 20062 Laguna Canyon Road. Bicyclists can either ride there or drive and ride their bikes from there. Or riders who covet their Sunday snooze time can pass on the canyon cluck and ride to a second check-in at 10:30 a.m. at 487 Shadow Lane near Bluebird Park. “Instead of city-dwellers, I guess we’re kind of like farmers,” said Tim Jones, one of the “coopsters” on the tour. 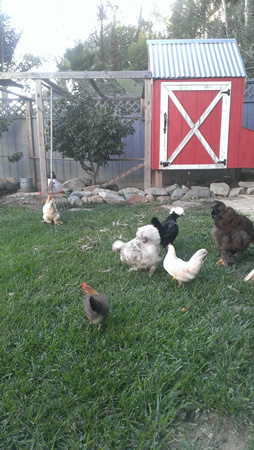 Jones’s coop in Bluebird Canyon is a veritable co-op of chickens, cats, dogs and a bunny co-habitating, and surviving. Somehow, he said, it’s working. “I don’t know how, maybe we just have good vibes; I don’t get it either,” he said. The dog mothers the chicks, the cat hangs with the bunny and they all love to play. Before the self-guided tour begins on Sunday, riders, with neighborhood coop maps in hand, will get a chance to listen to Helia Buyck, the volunteer caretaker of all things winged for the past 22 years at Anneliese School. Cluckers, she said, are smarter than they look. Buyck will relate stories from her just-finished first book, “If Chickens Could Talk.” She’ll let tourers know what chickens need to thrive in backyard bliss. “They are much more intelligent than people think,” said Buyck. “People don’t know anything about chickens. I tell people how loveable they can be.” And, she added as a teaser to her stories, they watch each other’s backs. Although there are more coops than 12 flying under the radar around town, as chickens tend to do, the coopsters willing to ruffle their Sunday feathers for welcomed gawkers say they’re within city regs. The city code allows for chickens as long as they have a house and fenced runway. Jim Beres, the city’s animal control supervisor, said he had no clue about the chicken coops or the tour. “They’re going to 12 different locations in town that have chicken coops? Hmm, that’s interesting,” he commented. “Chickens are actually quieter than dogs,” claims Reem Khalil, who, along with friend Kerry Bowers, seeded the tour. “We wanted it to be a community event, bringing people together to encourage a more sustainable lifestyle in an urban environment. It’s doable,” she said. Happy chickens, it seems, come from Laguna Beach. City code prohibits raising the gamely birds for, say, dinner at 6; no stalking of the hens, no chicken soup from the coops here. “Chickens aren’t just a commodity,” said Khalil. “They are loving pets.” Pets that produce eggs for poaching, yes, and droppings for garden compost. If you ask any of the coopsters on the tour if they eat their chickens, they only gulp. Many of the urban farmers are also vegetarian. “Uh,” gasped Julia Becker, astonished at the question. “No, we don’t eat them.” Becker and her daughters Lucinda and Clara raise money to buy chickens for people in third world countries, where they probably do raise them and eat them. Buyck said she’s a vegetarian, too, especially after watching documentaries on livestock slaughterhouses and the treatment of corporate-farmed animals. Laguna didn’t pull a California coup on the coop tour. Davis, Berkeley and Alameda all have tours, some for years. Phoenix even offers a parade replete with bike floats. But Jones said some of his hometown chickens lay eggs he’s never seen before. “I never knew there were green eggs,” he remarked. Ham anyone? Laguna Cyclery is offering a few bikes for the tour for free. Contact Reem Khalil at refinedbohemian@gmail.com to reserve a bike. Register for the tour online at http://seedsed.org/lbtourdecoop/.